A unique place in the middle of Saint-Germain-des-Prés’ Golden Triangle, at the corner of «Le Café de Flore», Louis Vuitton and Costes’ restaurant, «La Société», this old paper mill is located at the ground floor of a 1950’s building and has kept its steel structures and its volumes. Catherine Houard Gallery hosts fashion, cultural and communication private events. This area has a surface area of 1830 ft², divided in 2 levels. 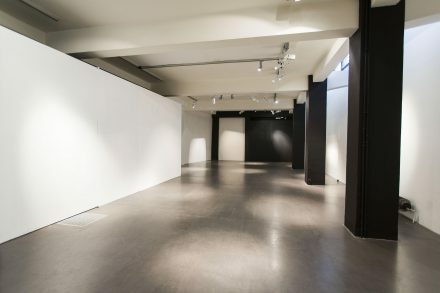 The gallery is composed of a 860 ft² first floor with a 33ft window benefiting from natural lighting, and a 969 ft² entresol with a high ceiling of 12 ft, white walls and waxed concrete grounds. This exceptional location, combines the elegance of a prestigious Art gallery and the renown of one of the most mythic place in Paris. We opted for a completely modular lighting achieved by Patrick Rimoux, who is working all around the world. Showrooms, products launching, press conferences, shooting sessions and film shootings… This space has already welcomed many of the biggest names of interior design (Bruno Moinard..), of fashion (Sonia Rykiel…), of literature, of artisitc production and of cinema. Between 200 and 400 people during a vernissage or an event. Seated diner : ground floor 35 people, entresol 45 people (approximately). Conferences : ground floor 50 people, entresol 100 people (environ).